Your Monograms Local Host® will help you get the most out of your two nights stay in London. 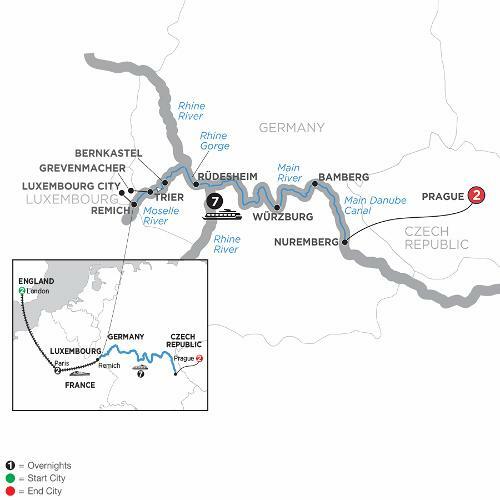 Transfer by high-speed train to Luxembourg City, then travel by motorcoach to Remich to board your Suite Ship® and start your Avalon river cruise. See the sights in “The City of Lights” with an expert guide, drive past the Latin Quarter, Les Invalides, Place de la Concorde, Eiffel Tower, the Arc de Triomphe and enjoy a Seine river cruise. Your Monograms vacation package includes helpful onsite support from your expert Local Hosts® both in London and Paris.